Creation: Appeared July 1933 as a renumbering of VA 301 from US 29 (now VA 293) Danville to Callands, then a brief duplex with VA 57, then northwest another 1.9 miles to SR 607 Worlds. This is the 2nd VA 41. Adjustments: In Aug 1936 (CTB), VA 41 was extended north to VA 108 (now SR 890) in Franklin County. In April 1949 (CTB), VA 41 north was truncated to VA 57 Callands, leaving behind a bit of VA 57 plus SR 969. 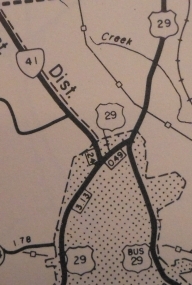 In August 1962 (CTB), VA 41 between today's US 29 Business and VA 293 was dropped from the primary system. This was affirmed as correct in the Dec 1970 CTB which described the primary route mileage in the City of Danville. However, the dropped segment remains posted to this day and is referred to in the VDOT Traffic Log as Urban Route (UR) 3759. Official maps have never shown it truncated on either the main map or Danville insets. The deletion is noted in the 2001 and 2003 route logs as well as the VDOT on-line transportation map. 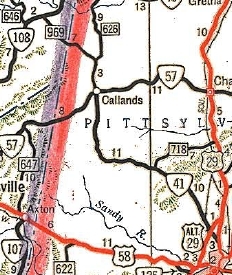 In several stages througout the 1960s, VA 41 was straightened out, leaving behind a lot of abandoned loops plus SR 1133 County Ln near Danville; SR 769 Early Rd and SR 816 Late Rd near Callands. 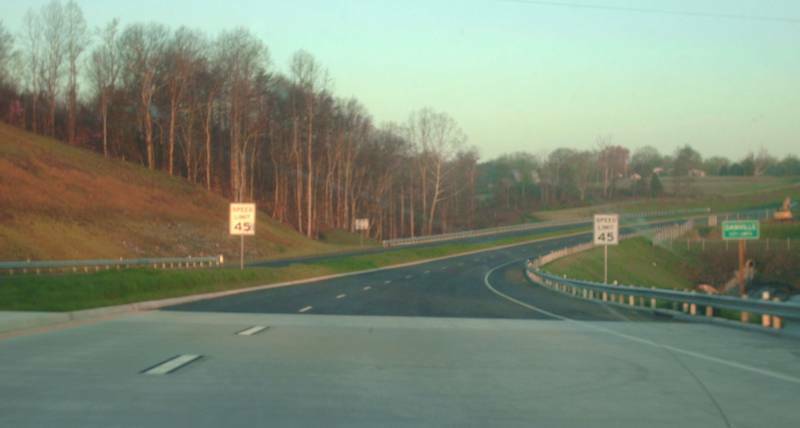 In Oct 2011 (VDOT), the Franklin Turnpike Extension from VA 293 east to US 29 Bypass was opened as newly constructed route. Throughout the project's planning and construction phase the CTB referred to this as VA 265. However it IS signed as VA 41. This makes VA 41 a discontinuous route. 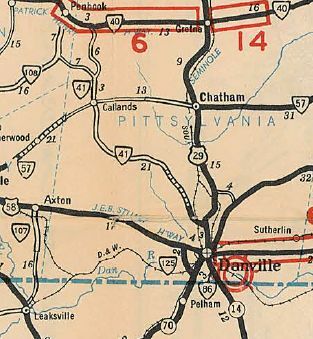 Note that the piece between US 29 and VA 360 opened up years earlier and was signed only as TO 29 or TO 360. Improvements: Upon designation only the first few miles of VA 40 was paved north off US 29 (now VA 293). In 1934, VA 41 was paved on its entire routing out to Worlds. In 1938, VA 41 was paved from Worlds ro VA 108. VA 41 was multilaned from SR 719 down to SR 743 in 2004. In 2011, VA 41 was multilaned from VA 293 to VA 360. Comment: VA 41 connects Danville to northwestern Pittsylvania County. Given its posted extension to VA 360, Franklin Tpk between US 29 Bus and VA 293 should be placed back into the primary system. VA 41 #1: Appeared June 1923 (CTB) as new primary routing running from Charles City CH west to today's VA 156 in Henrico County. VA 41 did not connect to any other part of the state highway system and up to this point Charles City County had no primary highways. 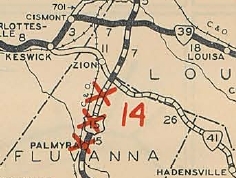 In March 1924 (CTB), VA 41 was extended west 3 miles. 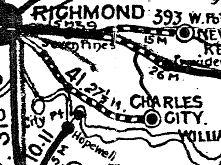 In Jan 1925 (CTB), VA 41 was extended west 6.4 miles to Richmond. 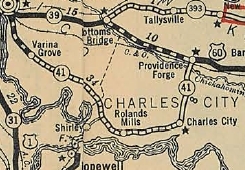 In June 1926 (CTB), VA 41 was extended from Charles City CH north to VA 39 (now US 60) Providence Forge. In Oct 1926, VA 41 was assigned to replace VA 321 from 1 mile west of Zion through Hadensville, Gum Spring, and Oilville to end in the Short Pump area west of Richmond, making VA 41 a discontinuous route. 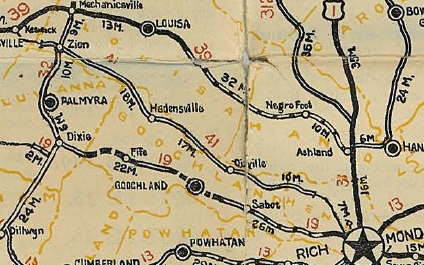 In Dec 1926 (CTB), the western piece of VA 41 was extended east 3.5 miles towards Richmond. 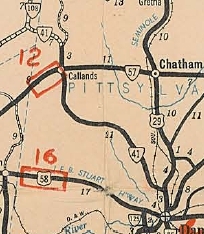 In March 1927 (CTB), the western piece of VA 41 was extended east to Richmond, to connect with the original piece of VA 41. Also, the western piece of VA 41 was extended west 2 miles. In Aug 1928 (CTB), VA 41 was rerouted at Charles City to instead head east 8 miles towards Barretts Ferry. The old route to Providence Forge became VA 413. Also in Aug 1928 (CTB), VA 41's western piece was extended to VA 39 (now VA 22) Keswick. Also in Aug 1928 (CTB), a new piece of VA 41 was created running from VA 392 (now VA 5) Williamsburg west 4.5 miles. In Dec 1930 (CTB), main VA 41 was extended east 3.5 miles towards Barretts Ferry (Rustic) and the Williamsburg piece was extended 2.8 miles west towards Barretts Ferry. About 1931, VA 41 was moved onto today's US 250 from today's SR 700 East Leake through Gum Spring and Oilville to the Short Pump area, leaving behind today's SR 700 Three Chopt-Providence Rd; SR 634 Three Chopt-Gum Spring Rd; SR 702/636; SR 612/621 to Centerville. In July 1932 (CTB), both pieces of VA 41 were extended to Barretts Ferry. In the 1932-33 timeframe, VA 41 was placed on US 250 between Fluvanna-Goochland line and East Leake, leaving behind Three Chopt-Shannon Hill Rd; SR 698; SR 699; SR 606 to Hadensville; SR 609 to East Leake. In July 1933, VA 41 was renumbered as VA 5. Today, from east to west, VA 41's final route was J Tyler Ln west to current VA 5-199, then followed current VA 5 to the Chickahominy River via Barretts Ferry Rd to the ferry across the river. In Charles City County, VA 41 used current 5 to Henrico County, except it used SR 645 at the ferry landing; SR 644 Courthouse Rd loop at Charles City C.H. ; SR 640/633 loop near Berkeley Plantation In Henrico County, VA 41 followed current VA 5 until it reached New Osborne Tpk. VA 41 initially followed New Osbourne Tpk , Newton Rd, Hatcher St, Williamsburg Ave, Fulton St (now stops at Hobbs Ln). VA 41 continued north across Stony Run Rd, the stream, and the RR tracks, before curling west around a loop up the hill to connect with Government Rd (then-US 60) at 36th St. An old bridge used by VA 41 is still visible looking south from US 60 Stony Run Rd. VA 41 then followed Broad St all the way through Richmond. West of Richmond, VA 41 followed today's US 250 to Albemarle County except: SR 653 loop near Ferncliff; SR 696 loop west of Ferncliff; SR 607 loop in and out of Fluvanna County; abandoned loop over to US 15; SR 615 to Zion and SR 627 SW back to US 250; SR 759 loop near Boyds Tavern; SR 616 to Keswick; VA 22 to Shadwell.